Join us on this photo adventure and discover a small beautiful fishing island that has been a destination for artists for over a century. Learn to gain a better understanding of your camera controls and how to compose your images with a creative eye. Group size is small allowing you an individualized photography experience with instruction ongoing all day and tailored to your level. All camera types and all skill levels always welcome. 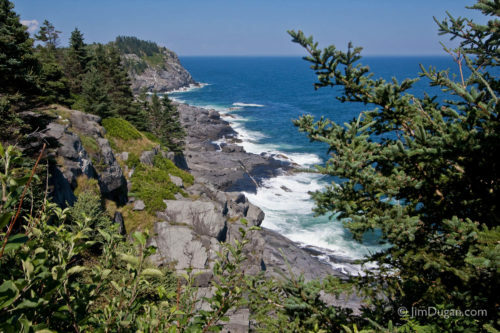 Times: 10am-6pm, meet at Monhegan Boat Line in Port Clyde. Or call to reserve a private tour to accommodate your schedule. For private tour rates go to the Private Rates page. Rates: Adults – $159, Ages 11-18 –$109, Ages 10 or under – free but must purchase a ferry ticket. All children under 16 must be accompanied by an adult. For paying participants fee includes boat, tour, and photo lessons. Does not include lunch. Payment is by cash, check if you are registering early enough, or if you prefer, book online for an additional fee. 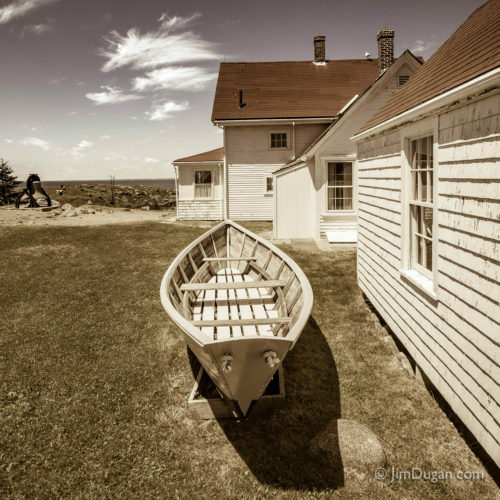 This 1-day photo tour will be unforgettable as you unplug from technology, step back in time, and explore a remote island with a year-round population of 65, and no paved roads. Discover for yourself Monhegan’s stunning landscape; rocky beaches, forest & meadow, and ocean cliffs the highest on the Maine coast with crashing surf below. Explore with the group or on your own. Visit artist’s studios, galleries, village scenery, hiking trails at Cathedral Forest and Wildflower Meadow, old shipwreck at Lobster Cove, solar powered, computer operated Lighthouse that sits high on a hill towards the center of the island and the Museum on its grounds that is housed in the former lighthouse keepers house. 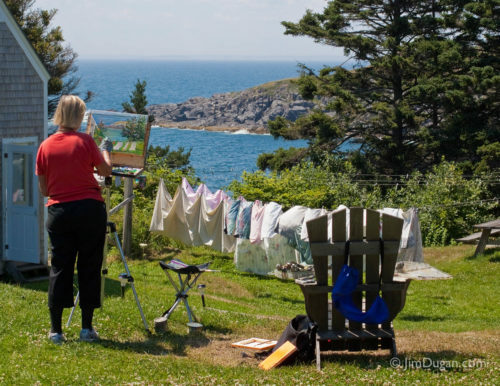 Originally settled due to its prime fishing grounds, the fishing industry continues, but for over a century Monhegan has been a summer destination for artists and travelers who seek tranquility and to submerge themselves in nature’s beauty. 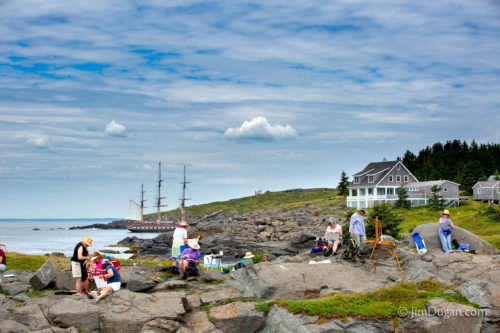 Those who have been inspired by its charm include well known artists such as Rockwell Kent, James Fitzgerald, George Bellows, Robert Henri, and Jamie Wyeth. You can view their work at the Museum, as well as historical, cultural, and maritime artifacts. Since we are going to be carrying all that we bring with us for the whole day you’ll want to pack light, yet at the same time bring what you need. If you can, we recommend using a backpack instead of an over-the-shoulder bag. Please wear good walking shoes. We will be on our feet most of the day. It will be easy to moderate walking, depending on how far you choose to go on the nature trails. Since there are no paved roads or sidewalks, the terrain can be uneven. Weather – This is a rain or shine (or fog) event. Dress accordingly for the weather, and dress in layers. It will be colder during the boat ride. The boat does have inside seating, however, if you want to photograph from outside while on the boat we recommend that you bring a light-weight wind breaker or rain jacket, and a light sweater that will pack easily once you’re on the island. Camera equipment – Any camera is acceptable, including smart phones and tablets. Make sure that your battery is fully charged and that you have plenty of room on your memory card for at least a few hundred pictures. Even so, we do recommend having a second memory card with you. If you have a DSLR you may want to bring additional lenses if you have them. Tri-pods can be bulky and heavy but if you usually use one then certainly bring it along. Food – We recommend packing a bit of snack food and definitely bring along some drinking water. We will be having a late lunch on the island. The cost of lunch is not included in the price of the photo tour. Suggested items – sun protection; sunscreen, sunglasses, a hat, etc. We will be outside most of the day. Warning – There is likely no cell phone reception on the island. Once you have registered you will be given further information about the tour and how to prepare. Please call if you have any questions before or after registration.